This is an oldie, but goodie. Always a hit with kids (and adults!). This recipe uses canned biscuits, and you need 2 cans of the big sized biscuits. I prefer the buttermilk kind, as opposed to the ones with the layers, but you can use whatever you like. The sweetened condensed milk topping is something new I tried this time, and I highly recommend adding it! Spray a Bundt cake pan with nonstick spray. Mix granulated sugar and cinnamon in zip top bag. Cut biscuits into small pieces. Shake biscuit pieces in bag to coat and place in pan. Melt butter and add brown sugar, stir to combine. Pour mixture over biscuits in Bundt pan. Bake at 350°F for 40 to 45 minutes or until golden brown. Cool for 2-3 minutes in pan and turn upside down on plate. Drizzle hot Monkey Bread with sweetened condensed milk. Serve warm. 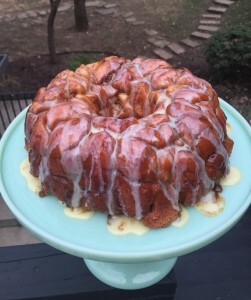 Copyright © 2015 Our Everyday Dinners - This is an easy recipe for how to make Monkey Bread.